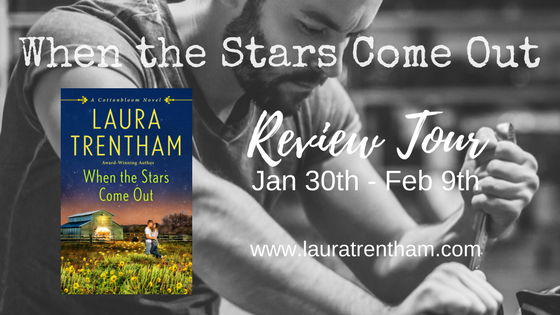 Laura Trentham takes readers back to her small southern town of Cottonbloom for more humor, emotion, and heartwarming romance in When the Stars Come Out. I've been reading this series from the beginning and with each book released, I become more invested in these characters who inhabit the two sides of Cottonbloom: the upscale Mississippi side of the river that bisects the town, and the working-class Louisiana side. In this fifth book of the series, Trentham continues to tug at readers' heartstrings with Jackson and Willa's emotional journey. People joke that Jackson Abbott's most meaningful relationship has always been with his car and it's probably not far from the truth. He grew up working on cars in his late father's garage and racing them on dirt tracks has always been his escape when life gets rough. He's a good guy - kind and generous - but, except for his brothers and his late father, he's never allowed himself to get close to anyone, certainly not to a woman. A lot of that can be attributed to events early in his life. Willa Brown is keeping secrets. Hired by their late father, she's worked as a mechanic at the Abbott Brothers Garage for the past couple years and is invaluable to the business. She's also had a crush on Jackson for that entire time but wouldn't dream of acting on it. She's been on the run for five years and has learned the hard way that she can only depend on herself. Jackson always knew how important Willa was to the business but it isn't until he fears she might leave that he realizes how important she is to him. Can he convince Willa to take a chance on him? The two of them are an unbeatable team under the hood of a car but will starting a relationship outside the garage deepen their bond or send a skittish Willa running for the hills? I loved these two. They're so obviously perfect for one another but both have issues to confront and overcome before they can have their happy ending. Trentham guides them with a deft hand, allowing their journey to unfold slowly and realistically, infusing it with the awkwardness, humor, sweetness, fear, forgiveness, and romance it deserves. The richness of the Cottonbloom communities and their citizens add to the appeal of this series and this story. The relationship between Sutton Mize and Jackson's twin, Wyatt (Leave the Night On) continues to evolve and we're given more insight into the other two Abbott brothers, Mack and Ford. Mack is the next Abbott brother destined for love in Set the Night on Fire, due for release July 31, 2018. 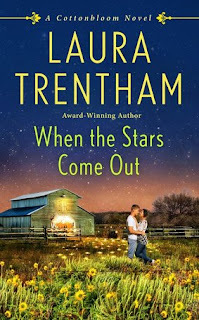 Clayton Preston, a secondary character with a tumultuous past (Light Up the Night) makes a pivotal appearance in When the Stars Come Out, giving me hope that Trentham may have more in store for this ex-con brother of Cottonbloom, Mississippi's Chief of Police. 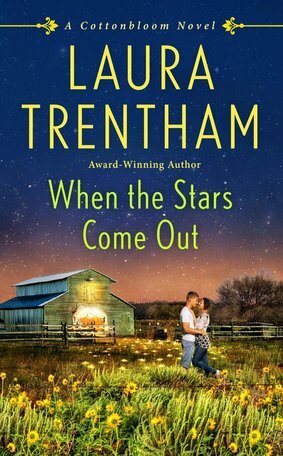 If you enjoy small-town romance rich with humor, deep emotion, and plenty of heart, I highly recommend Laura Trentham's Cottonbloom books. While all the books stand on their own, for a deeper understanding of the Abbott brothers I would recommend reading Leave the Night On first, followed by When the Stars Come Out. PJ: As the book blurb states, "Jackson's most meaningful relationship has always been with his car." With what make and model car would you like to have a meaningful relationship? Ha! I’m going to be honest and admit that I don’t have an affinity for cars. As long as it starts reliably and gets me from point A to B, I’m all good. But, I married a man with a love of cars. He’s a mechanical engineer who restores cars as a hobby. We have a 1956 Volkswagen Bug, a 1967 Volkswagen Transporter, a 1973 Datsun Z, and a supercharged 2014 Mustang in our garage/driveway at the moment. That’s not counting my (very reliable) sedan and his pickup truck. We look like Sanford and Sons around here! The idea of writing about three mechanic brothers was inspired by my husband and the hours and hours (and hours) of car shows I’ve been forced to watch with him. I guess it paid off! PJ: How many more books do you have planned for Cottonbloom? PJ: Willa is a top-notch mechanic. What skill do you have that readers might be surprised to discover? It’s sad how long I’ve been sitting here thinking about this question! Lol. I’m a chemical engineer by degree and know my way around a chemical plant which I suppose is an unusual path for a romance writer. I’m also a better than average cook. For some reason this always surprises my extended family, I suppose because I subsisted on Hot Pockets and salads until I got married. But my job as a chemical engineer was basically “cooking” in huge 600 gallon reactors. Not a huge stretch. Readers, what skill do you have that might surprise us? 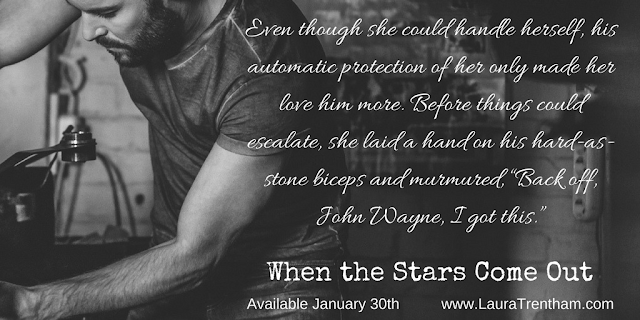 Click for a list of stops on the When the Stars Come Out review tour. You know I have been hearing about the Cottonbloom series, and now I know how good it is. And of course one more time, I have found a list of books I really and truly need. Y'all are killing me. Good luck in the contest, Annette. Maybe you'll get lucky and win! I now have to catch up on this series. I've definitely been missing out on a wonderful series. I grew up with 4 brothers so the first car I crushed on was a 77 Camaro. I have the first book in the series. Second book is on my wish list. I have no talent that is unusual. I did learn how to read and write steno. I've only read the last 2 books in this series and have to get caught up. I really enjoyed Willa & Jackson's story. My car crush was a MGB from the 70s but my legs weren't long enought to reach the pedals when I sat in one. Story of my life, being so short. One of my brothers had a MGB in the 70s. He looooooooved that car! This is a new series and a new author for me. I read an excerpt from When the Stars Come Out and was quite please with what I read. Characters I could relate to, a sense of humor, interesting situations. I will be looking for this one for sure. Would love to win the series. Missed your question. I am trying to think of a skill I have that people would be surprised by, but can't think of any. I am pretty good at planning trips and events.